By: Joseph S. Bermudez Jr.
On February 7, 2015, North Korea’s Rodong Sinmun published an article describing Kim Jong Un’s recent trip to the Korean People’s Navy (KPN) East Sea Fleet during which he observed the test of a canister-mounted anti-ship cruise missile (ASCM) from a patrol vessel. Also present for the test launch was Rear Admiral Jin Chol Su, commander of the East Sea Fleet. 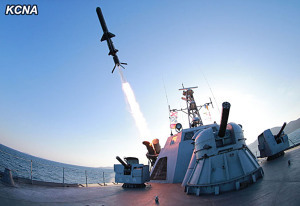 The system tested is described as being a “new type of cutting-edge anti-ship rocket” that was developed by the Academy of Defense Science subordinate to the Korean Workers’ Party’s Munitions Industry Department. Figure 1. Kim Jong Un watching the test of the KH-35 anti-ship cruise missile. While the report states that the missile was developed by North Korea, it appears to be a Russian Kh-35E anti-ship cruise missile. Whether the KPN acquired the system directly from Russia or a third party is unclear as is whether it is a licensed produced or reversed engineered version of the missile. Should the new system be successfully integrated into the KPN and widely deployed it would represent a significant step towards redressing the service’s obsolescence and increasing the threat poised to South Korean and US Navy vessels in the region. Assuming that a Kh-35 anti-ship missile is successfully deployed with the KPN, a logical next step, which would extend the threat that this system poses, would be to deploy a coastal defense version. The potential threat posed by a Kh-35 system could be further expanded if the Korean People’s Air Force (KPAF) deploys the Kh-35EUL air-launched version. This could endow its ancient obsolete fleet of Il-28 light bombers with a modern standoff missile capability. All of these potential developments are, just that, potential developments. The launching of a few missiles in and of itself, does not change the threat presented by the KPN. The North’s navy—and military industrial system in general—has a long history of slow and often poor system integration. While these recent developments are important, time will determine whether North Korea has the ability to realize the potential of this new system. Aside from the missile itself, the Rodong Sinmun provided several of the most detailed images yet available of the KPN’s class of modified-catamaran-hulled missile-carrying fast patrol craft (PTGF). Figure 2. A KH-35 anti-ship cruise missile immediately after launch. Introduction of 14.5 mm and 30 mm Gatling-gun close-in-weapon-systems (CIWS) to replace old single- and twin-mount systems on existing patrol vessels. Construction of a class of small catamaran-hulled fast patrol craft with at least three subclasses (PTF and PTFG). Construction of a class of very slender vessels (VSV) with at least three subclasses including patrol (PTF) and high-speed infiltration landing craft (HILC). Construction of a anti-submarine warfare helicopter frigate (FFH). In the design and construction of the modified-catamaran-hulled fast patrol craft and later the very slender vessels, the navy attempted to incorporate a degree of stealth technology. Each class has faceted hulls and superstructures to reduce detection from radars and lasers. The lead vessel of the PTF/PTFG class was completed sometime around 1998 and approximately six ships have been constructed to date. Of these vessels, only two are known to be deployed with the East Sea Fleet—one based at the Wonsan shipyard and the other at the Munchon Naval Base. 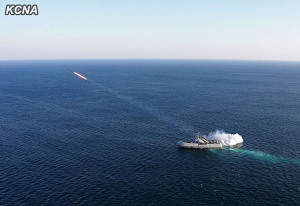 The vessel from the Munchon Naval Base conducted the recent Kh-35 missile test. This vessel is approximately 38.5-meters-long and 13-meters-wide and has been modified with the addition of a sponson on each side of the hull. Two canister launchers for KH-35 missiles are mounted on each sponson. The vessel is armed with a Furuno search radar and armed with four canister launchers (two on each side) for KH-35 missiles, two 30 mm AK-230 CIWS (one forward, one aft), four 14.5 mm Gatling guns (two forward, two aft) and what appear to be two six-round SAM launchers on the stern. Figure 3. A close-up view looking aft of the KH-35 anti-ship cruise missile as it is being launched. The gun mounts are two 14.5 mm Gatling guns and a modified 30 mm AK-230 close-in weapon system. Given the small number of ships constructed and the fact that at least three configurations were built, it is possible that the class was intended to be used to test new naval designs (e.g., stealth, modified catamaran hull, etc.) and systems configurations (e.g., armament, electronic warfare, etc.). This possibility may be supported by the fact that a larger vessel of similar design is now under construction. Figure 4. 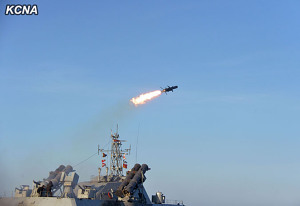 A close-up view looking forward of the KH-35 anti-ship cruise missile as it is being launched. The gun mounts are two 14.5 mm Gatling guns and a modified 30 mm AK-230 close-in weapon system. On the corner of the stern is what appears to be a flare/chaff launcher. Note the two personnel crouching next to the AK-230. The angle and location of the KH-35 above the vessel suggests that this image may have been altered. 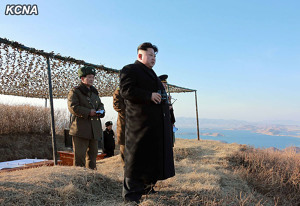 Joseph S. Bermudez Jr. is Chief Analytical Officer of AllSource Analysis, Inc.
 “Kim Jong Un Watches Newly-Developed Anti-Ship Rocket Test-firing,” Rodong Sinmun, February 7, 2015. Joseph S Bermudez Jr., “Korean People’s Navy’s 30mm CIWS,” KPA Journal, December 2012, Vol. 2, No. 12, pp. 1-2, http://www.kpajournal.com/vol-2-no-8-august-2012/ (accessed April 8, 2014); and Joseph S. Bermudez Jr., “Korean People’s Navy’s 14.5mm 6-Barrel CIWS,” KPA Journal, August 2012, Vol. 2, No. 8, p. 7, http://www.kpajournal.com/vol-2-no-8-august-2012/ (accessed April 8, 2014). Curtis Melvin and Joseph S. Bermudez Jr., “The December 7 Factory: Producer of Maxi Pads and Naval Stealth Technology,” 38 North, April 9, 2014, https://www.38north.org/2014/04/melvinberm040814/.